This is the second Harold Meltzer (1966- ) disc to come across my desk in the last two months or so. This time he is heard on the venerable Bridge label which produces a great deal of quality recordings of new and recent music. This one contains four works spread over 15 tracks and, like his previous CD, includes some vocal music alongside two chamber music pieces without voice. Meltzer seems to be one of a generation of composers who have absorbed many of the vast styles and methods which flowered in the twentieth century. He is not easy to categorize except as a composer. There are in his music gestures and ideas that span neo-romanticism, minimalism, etc. but he has a distinctive and very affecting style. Meltzer’s ability to write for the human voice and these songs put this reviewer in the mind of composers like Ned Rorem. I’m not saying he exactly sounds like Rorem, just that he is as effective in his writing. Stylistically there is at times an almost impressionist feel in these songs and, while the piano accompaniment is wonderful, they almost beg to be orchestrated. There are two song cycles on this disc, the first setting poems of Ted Hughes (Bride of the Island, 2016) and the second setting poems by Ohio poet James Wright (Beautiful Ohio, 2010). Tenor Paul Appleby had his work cut out for him and he delivers wonderful performances with a voice that is well suited to lieder but clearly with operatic ability as well. Pianist Natalya Katyukova handles the intricate accompaniments with deceptive ease in these cycles. There are two chamber works on this disc. The first is Aqua (2011-12) which is inspired by the architecture of the so-called Aqua building in Chicago by architect Jeanne Gang. In a city known for its fine architecture this 2007 building manages to stand out in its uniqueness. Need I say that his piece suggests impressionism. It’s string writing is complex with a vast mixture of effects that, under the interpretive skill of the Avalon String Quartet, suggest movement in much the way the building itself does. This is genius, the ability to mix all these string techniques into a coherent whole. It is a basically tonal work and it is seriously engaging but listener friendly in the end. The second chamber work is a piece written for the 50th anniversary of the death of legendary violinist Fritz Kreisler. As it happens the Library of Congress, who commissioned the piece, owns Kreisler’s Guarneri violin and it is they who commissioned this work. Miranda Cuckson does the honors on violin ably accompanied by the trustworthy Blair McMillen. To be sure some of Kreisler’s style is used here but this work, “Kreisleriana” (2012) comes across as more than an homage, more a work informed by Kreisler. It’s a really entertaining piece too. Thanks in particular to Bridge Records for releasing this. Bridge is one of those labels whose every release deserves at least a bit of attention. This time I think they’ve found a fascinating voice in Meltzer’s works. Now how about some orchestral work? Well it’s been 100 years since Claude Debussy (1862-1918) left the earthly plane and anniversaries are good times for a re-evaluation. Usually this just means issuing recordings of a given composers works, mostly the composer’s most popular. Jacob Greenberg has chosen to record Debussy’s Preludes for Piano Books I and II (1909-1913). But that alone seems a bit pedestrian so he adds in Alban Berg’s (1885-1935) Op. 1 Piano Sonata (1909), Anton Webern’s (1883-1945) masterful Variations for Piano (1936), and Arnold Schoenberg’s (1874-1951) “Book of the Hanging Gardens” Op. 15 (1908-9) as well as a few additional Debussy pieces. Greenberg is a sort of refugee from the International Contemporary Ensemble. For this recording he also conscripts the fine soprano (and fellow ICE refugee) Tony Arnold. These two have already amassed quite a few recordings of repertory from this era. This mix provides a context for the listener which shows where the Preludes fit historically and demonstrates some of the similarities in sound between these early 20th Century works. We hear music written between 1908 and 1936 by four composers. Hearing these works together gives the listener a sense of how some of the best “contemporary” compositions of this brief era sounded. Indeed there are similarities here and one can see the emerging style which would become known as “expressionism”. It is clearer how this emerged from Debussy and Ravel’s “impressionism” when you hear related works from the same era. This reviewer had not been familiar with Schoenberg’s “Book of the Hanging Gardens”. It is one of the less performed of his works. These songs have a militantly atonal sound. Vocalist extraordinaire Tony Arnold puts real muscle into her reading of these songs. The disc is worth acquiring for her performance alone. In some ways this cycle appears to have been Schoenberg’s “Tristan und Isolde” meaning that he had stretched the limits of tonality and, unlike Wagner, he chose to develop a method which would ensure that there is no tonal center in his music. He developed his method of 12 tone composition and rolled out his first example of this new method in 1925. What is striking is that this Schoenberg song cycle dates from pretty much the same time as the Debussy Preludes and Alban Berg’s Piano Sonata. One gets a sense of some of the tensions involved here. Try to imagine being in the audience and hearing the wide stylistic differences between these two works and realizing that they are essentially from the same era. Add in the much later Variations by Webern and one gets a sense of how far music could go, stylistically, based on Schoenberg’s methods. Obviously the Debussy Preludes are the main focus here and these are acknowledged as classics of the repertoire. They are most ably performed here but what struck this listener the most was the sound of those preludes in the context of the other pieces here which were part of that same 30 year span. One can begin to hear perhaps some affinity between the Debussy and the later thornier harmonies and rhythms that typify the expressionistic style which would dominate much of the mid-twentieth century. This is a fabulously entertaining recording and a sort of music history lesson as well. Greenberg is a strong and assertive musician with an obvious feel for these pieces. His choice of repertoire makes this a particularly good choice for the listener who is just beginning to explore this musical era and an eye-opening program for the seasoned listener. Great set. Other Minds has been the the darling of composer/producer Charles Amirkhanian since its founding in 1993. Along with television producer and arts patron Jim Newman he has presided over the 25 years of this renowned festival which has consistently brought the finest new music composers and performers to San Francisco. There is little doubt that this year’s festival has to be very close to Amirkhanian’s heart. Words have been central to his career at least since 1969 when he began his work as a producer at KPFA. In the 23 years he spent there he presented countless hours of musical programming and interviews. He crossed paths with most of the major stars in contemporary classical music and many stars whose genre may not be captured by the classical label. A look at his programming choices and interviews from his time there defined new music for the Bay Area and beyond. After his tenure at KPFA ended in 1992 he continued exploring cutting edge music and musicians bringing them to San Francisco for live performances. His work as producer and curator has tended to overshadow his work as a composer, sound poet, and spoken word artist. This year’s OM festival is dedicated to speech, sound poetry, and the spoken word. It is about both the history and the present state of the art. In many ways Amirkhanian’s 1975 release “10 + 2: 12 American Text Sound Pieces” on 1750 Arch Records (now on an OM CD 1006-2) can be seen as sort of the starting point for this festival. This masterful anthology includes works by Charles Amirkhanian (1945- ), Clark Coolidge (1939- ), John Cage (1912-1992), John Giorno (1936- ), Anthony Gnazzo (1936- ), Charles Dodge (1942- ), Robert Ashley (1930-2014), Beth Anderson (1950- ), Brion Gysin (1916-1986), Liam O’Gallagher (1917-2007), and Aram Saroyan (1943- ). “Word! Thou word that I cannot speak! At the end of the second (and last completed) act of Arnold Schoenberg’s powerful opera “Moses und Aron” (1932) Moses sings, or actually half speaks and half sings this text lamenting his expressive deficits. Speech song or, in German, sprechgesang is an invention by Schoenberg in which the singers are asked to find a point between speech and music. Perhaps this is a good example of some of the artistic thinking going on at about the time when speech music/sound poetry began to take shape. Some of the history of sound poetry is featured in this unprecedented 6 day festival (April 9-14). Some of the earliest practitioners of this unusual genre include the German artist Kurt Schwitters whose composition Ursonate (1922-32) will be performed in its entirety, a rare event by itself. Another early gem will be the Spoken Music (1930) by German-American composer Ernst Toch. This three movement suite has been known for its last movement, the Geographical Fugue. The other two movements, once thought lost, were discovered in sketches in 2006 and reconstructed by Christopher Caines. The now complete version will be presented I believe on day 3. It is beyond the scope of this blog post to tell the history of text sound so I will refer readers to the Other Minds website for further details. Or you could come to the festival too I suppose. With due respect given to the past the festival will move on to the present. San Francisco Beat Poet Michael McClure (1932- ) will make an appearance as will post beat colleagues Anne Waldman (1945- ), Clark Coolidge (yeah the guy from that cool anthology), Aram Saroyan (another guy from the classic text sound disc). Alvin Curran in conversation last year in Berkeley. Other Minds alumnus Alvin Curran (1938- ) will be premiering his collaboration with Clark Coolidge entitled, Came Through in the Call Hold. Curran’s eclectic sensibilities will doubtless result in an interesting composition. This event alone, at least for this writer, is worth the price of admission. And this is just the first day! Other events include workshops, discussions of the history of the art, and even some curious variations on a theme. Apparently the writer Lawrence Weschler is the grandson of Ernst Toch and has written a variation on the Geographical Fugue called, The Medical Fugue which will be premiered at this festival. The increasingly ubiquitous pianist Sarah Cahill will be present to perform Virgil Thomson’s unusual but entertaining setting of a Gertrude Stein (a one time Oakland resident) text called Capital, Capitals. She will accompany the men of the Other Minds Ensemble. Jaap Blonk will be tasked with performing Schwitters’ Ursonate and, along with Enzo Miranelli will also perform other historical works including some by a couple of Italian Futurists. Other Minds Administrative Director Randall Wong will end the evening by undertaking a performance of the late great Cathy Berberian’s Stripsody. That promises to be a wild evening I think. Northern Europe, including the Netherlands and the Scandinavian countries will literally have their day. As it turns out they are doing a great deal of creative work in this increasingly diverse genre of speech music. Other Minds is at its best in introducing the new and the innovative from wherever Charles’ radar has tracked it down. Indeed Mr. Amirkhanian and his wife, artist/photographer Carol Law traveled throughout these regions in the early 70s talking with and learning from these diverse artists. (Amirkhanian’s work, Just was recorded in a Scandinavian studio during one of those trips). As usual homage will be paid to the past with some recorded classics by Sten Hanson, Åke Hodell, and Lily Greenham. Some new voices will be introduced including Tone Åse and Sten Sandell. The Norwegian/Russian-American duo OTTARAS (consisting of visual poet Ottar Ormstad and composer Taras Mashtalir will also perform. One can fully expect a mind expanding experience which will redefine the possibilities of the art form. Auspiciously or perhaps dangerously Friday the 13th has been reserved for Bay Area talents. First up will be the man of the hour, Charles Amirkhanian. Hearing him do his work live is an uncommon but entirely enjoyable experience. If that alone weren’t enough we will get to hear the even rarer public collaboration between him and his life partner Carol Law whose photography and collage work deserves wider recognition and will happily get that here. Trained in both linguistics and music, Amy X Neuberg will be on hand to perform her indescribable electronic cabaret including the world premiere of “Say it like you mean” and other genre bending work. She is another valued Other Minds alumnus having given numerous performances at the festivals. Stanford professor Mark Applebaum, another alumnus will present “Three Unlikely Corporate Sponsors” which premiered at Stanford in 2016. Enzo Miranelli will conclude the evening with his theatrical combination of movement and text in “Fame: What I Want to Say”. The festival concludes on Saturday April 14th with Jaap Blonk followed by the wonderful San Francisco based Pamela Z who, like Neuberg uses electronics, but creates her own unique sound world. She too is an alumnus of Other Minds. Another composer from that great anthology, Beth Anderson, will make an appearance to perform “If I Were a Poet”, “I Can’t Stand It”, and “Ocean Mildew Minds”. The finale will feature Susan Stone and Sheila Davies Sumner performing excerpts from two works, “House with a View” and “Loose Tongues” both dealing with the lives of working class southern women. This will be both a feast and a marathon but it promises to be one of the finest Other Minds productions maybe ever. Come to be entertained, come to be challenged, come to expand your mind. You’ll never be the same. See you there. Steven Stucky (1949-2016) was sadly taken from the world too soon. But we can rejoice in this wonderful new disc of (mostly) first recordings of some of his wonderful orchestral music and songs. 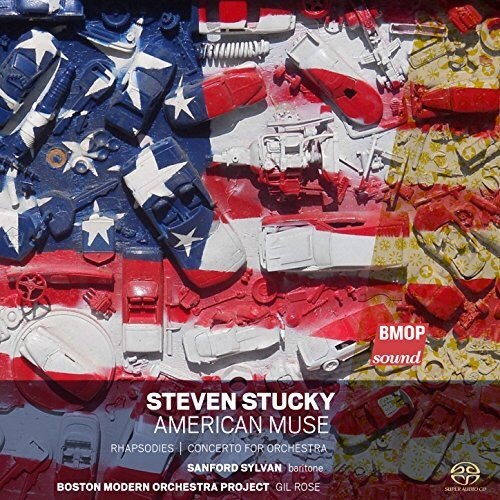 Boston Modern Orchestra Project adds another entry to their growing discography of must hear American music with this beautiful recording. Three works are featured, Rhapsodies (2008), American Muse (1999), and Concerto for Orchestra (No. 1, 1987). Only one, American Muse has been recorded (on Albany Records) before and all are worthy selections from the composer’s ample catalog. Rhapsodies, the most recent work, is also the shortest at just over 8 minutes. It was commissioned by the New York Philharmonic and the BBC Symphony and is for large orchestra and sounds as though it could serve as a movement in another Concerto for Orchestra. Stucky, who was an expert on the music of Witold Lutosławski (1913-1994), was a master orchestrator as was Lutosławski though Stucky’s style is distinctly different reflecting a sort of friendly romantic modernism with serious virtuosity. This little gem gives the orchestra and, no doubt, the conductor, a run for their money in this virtuosic and highly entertaining little sonic gem. It was premiered in 2008 under Lorin Maazel. The Los Angeles Philharmonic commission, American Muse was written with the fine baritone Sanford Sylvan in mind. It is a four song cycle setting poems by John Berryman, e.e. cummings, A.R. Ammons, and Walt Whitman and was premiered in 1999 under Esa-Pekka Salonen. Sylvan is a very fine interpreter of American music and first won this reviewer’s heart with his rendition of John Adams’ The Wound Dresser (also a Whitman setting). One should never miss an opportunity to hear Sylvan’s work. Again we are treated to Stucky’s acute and subtle sense of orchestration which works with the poetry unobtrusively paralleling the words with the musical accompaniment and seemingly creating its own poetry in sound. Sylvan is in fine voice and seems to be enjoying his performance, a very satisfying experience. The inclusion of Stucky’s first Concerto for Orchestra which was commissioned by the Philadelphia Orchestra and premiered in 1988 (under Ricardo Muti) will satisfy fans of this composer’s work as it provides an opportunity to hear “the one that got away” so to speak. It was the runner up for the Pulitzer Prize which he would later win for his Second Concerto for Orchestra (2003) in 2005. In it’s three movements Stucky is clearly the master of his realm and creates a wonderful listening experience. His sense of drama and emotion are stunning and serve to underscore the dimension of what the world has lost in his passing. But it is time to leave sorrow aside and let the music speak and thus provide the composer with a dimension of immortality. As usual the performance and recording are impeccable and Gil Rose continues to record wonderful music that deserves more frequent hearings and does honor to the memory of a cherished artist. Now can a recording of Stucky’s 2012 Symphony be far behind? Let’s hope so. This is a nice little program of pieces for clarinet and piano by 20-21st century composers. It might even be a representation of the state of the art for this genre. All of these pieces are basically tonal and would work well in a recital. Michael Norsworthy, professor of clarinet at Boston Conservatory at Berklee has an impressive set of credentials in the interpretation and performance and teaching of new music. This performing academic has quite a list of recordings to his credit. David Gompper is a composer and pianist with a similarly extensive set of credentials in support of new music (his own and others’). The disc opens with a six movement suite of short pieces by Robert Beaser (1954- ) called, Souvenirs (2001-2). Beaser is one of the finest composers of his generation and his tonal style was a hallmark of his work from the very beginnings. These short, personal sketches are a delightful example of his work. These pieces were originally written for piccolo and piano and are here presented in the composer’s transcription for clarinet and piano. The next piece, Black Anemones (1980) is originally for flute and piano and is a sort of modern classic (here is a recent review of the flute and piano version). The Pulitzer Prize winning Joseph Schwantner (1943- ) is also among the finest composers working today. This transcription for clarinet by Mr. Norsworthy will most certainly guarantee further performances. This is truly lovely music inspired by poetry of Agueda Pizarro. Three American Pieces (1944-5) by Lukas Foss (1922-2009) are another sort of classic set of pieces. These are early compositions in a neo-classical/nationalist style characteristic of this period of Foss’ compositional style. It is great to have a new recording of these entertaining pieces. Foss is due for a reckoning I think. Marti Epstein (1959- ), also a professor at Berklee was represented in an earlier review of a disc (here) dedicated entirely to her gentle music imbued with memories of her upbringing in the great plains of the Midwest. Nebraska Impromptu (2013) is characteristic of this composer’s gentle but substantial music. Her website also contains a very interesting occasional blog that is worth your time. Derek Bermel (1967- ) is here represented by schiZm (1993-4). Originally for oboe and piano the composer also made this transcription for clarinet and piano. Bermel describes some of the fascinating techniques that underlie the structure of this two movement piece but the result of those techniques is a very interesting piece of music. Last but definitely not least is the title track Traceur (2014-5) by composer/pianist David Gompper (1954-). It is the longest and most complex of the pieces presented and requires the most involvement on the part of the musicians as well as the listener. I don’t mean to imply that this is difficult music because it isn’t. It is substantial music whose charms demand close listening, an effort for which one will be rewarded. This lucid recording was produced by Norsworthy and Gompper (with the assistance of Robert Beaser in the recording of his work). It was recorded in 2015 with editing and mastering by Patrick Keating. Very nice disc. Highly recommended. This is the second album by composer/pianist Brian Buch. He holds a B.M. in composition with emphasis in piano performance from Indiana University and a Doctorate from Boston University. He studied composition with a variety of notable teachers including Don Freund, P.Q. Phan, Sven-David Sandstrøm, Nancy van de Vate, Sam Headrick and Richard Cornell. He lists his mentor as Alla Cohen, a name unfamiliar to this writer but no doubt a significant teacher and composer. This album was released in 2015 and contains tracks comprising 5 compositions with multiple movements. These represent a small portion of his output which apparently includes music for various ensembles including vocal, orchestral and chamber music. All the pieces on the present album were written between 2014 and 2015. These seem to be very personal pieces and the poetic titles reflect a sort of post-romantic style reminiscent of Bartok and Scriabin and perhaps even Debussy. This music benefits from multiple hearings and his performances are engaging and, no doubt, definitive. His muscular and assertive playing matches the poetic intensity of the music. Poems to Sing at Night 1 and 2 both have poems which are to be recited before each performance though that is not done on the recording for some reason. Both pieces are in four distinct movements while all the others are in three movements. One hears jazz and classical influences here and the medium is basically tonal.He is not afraid of dissonance and unusual harmonies but the listener need not fear either because the music is always listenable. John Weston recorded and engineered this album which was recorded in April, 2015 at the Futura Studios in Roslindale, MA. The sound is warm and lucid. In some ways this album seems to hearken back to the romantic composer/performer of the 19th century with its very personal style and poetic rather than classical forms. This young man (b. 1984) has established and is developing a very personal style which bears watching/listening. Very enjoyable album.